In this update, we’ve added the ability to reorder habits (tap the gear icon in the upper left corner and then the Edit Habits option). We also changed and fixed a number of interactions: we m.. 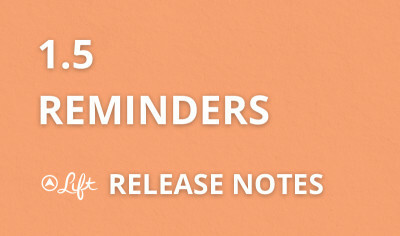 Lift 1.5 is our biggest new release since launch and reminders are the biggest new feature. Download now. Look in settings. You now have two types of reminders: a general prod based on how well you..
It’s time for New Year’s Resolutions and we’ve just released our biggest update to Lift. Download Lift. Get motivation for any goal. In the four months since we launched we helped creat.. There are two immediate changes in this release. 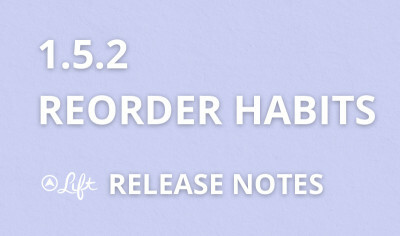 We’ve added more ways to browse habits and we’ve made stability improvements (you’ll especially like these if you’ve experienced the app unchecking s..